Reading whatever she can get her hands on, and still awaiting her Hogwarts letter, Stella has adored books since she can remember. 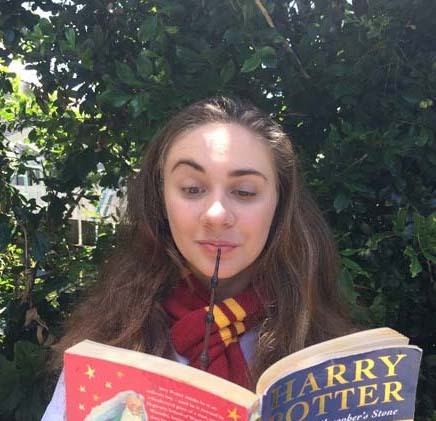 A passion for learning new words and exploring new worlds has led Stella down many paths and rabbit holes, eventually taking her to Woodford, where she excitedly waits to share her thoughts on all her favourite novels and writers with bookworms alike. Come celebrate the diversity and appreciation for your favourite LGBTQA+ books and characters in Woodford’s Book Club, led by Stella Peterson and Georgia Davies. Focusing on books that honestly and positively represent the LGBTQA+ community and make for an enjoyable read, be proud of who you are and share your favourite novels in this colourful book club. Welcoming all writers– share your favourite original and inspired work during this special Woodford Book Club session. Aspiring authors come together and share their love for fiction and original works, discussing the struggles of being a writer and greeted with mutual understanding. Come share the feels with Stella Peterson and Georgia Davies in FANFICTION, a Woodford Book Club special. Join Stella Peterson and Thomas Good as they explore their favourite Sci-Fi and fantasy novels. Featuring intergalactic space battles, faerie Courts, dragons, aliens and more, are all celebrated and discussed in this Woodford Book Club session. Finally, all that reading comes to good use! Join your fellow book nerds in a Trivia showdown featuring titles such as Harry Potter, Hunger Games, the Grisha Trilogy and more. Unique and book-related prizes to be won – so may the odds be ever in your favour! Finally, all that reading comes in good use! Join your fellow book nerds in a Trivia showdown featuring titles such as Harry Potter, Hunger Games, the Grisha Trilogy and more. Unique and book-related prizes to be won – so may the odds be ever in your favour!